WHO CREATES MEDICAL WASTE AND HOW CAN GLYCON BIOMEDICAL WASTE SERVICES HELP? When one speaks about medical waste, many people may be astonished that hospitals and clinics are not the only types of institutions that create dangerous waste and/or bio-medical waste. Actually, the list is growing with the different types of businesses and facilities that every day add to the medical waste stream each. In order to see if your business made the list and to learn how Glycon LLC can help you with removal and disposal of your medical waste we are offering you to read the following. Medical waste is classified as “any solid waste generated in the diagnosis, treatment or immunization of humans or animals, in research pertaining thereto, or even in the process of testing of biologicals”. That is why there exist some businesses and facilities that may be disposing of medical waste by simply throwing it in the trash. To learn why this is a big “no, no”, read our blog, “3 Reasons Why Bio-Medical Waste Services Are Necessary”. Let’s see, schools and daycare facilities have a nurse on staff so as to take care of accidents such as a bloody knee or nurses may be responsible for managing daily shots. In this case, the nurse would need to dispose of the used needles in a sharps container. Veterinary offices, dental offices, and lab and research facilities also require a proper removal and disposal services. However, the in-home care industry is considered to be one of the fastest growing business. There exist a growing number of home health nurses who help patients in their homes after surgeries or even on a daily basis. Hotel chains, tattoo parlors, and manufacturing facilities also are considered industries producing medical waste. 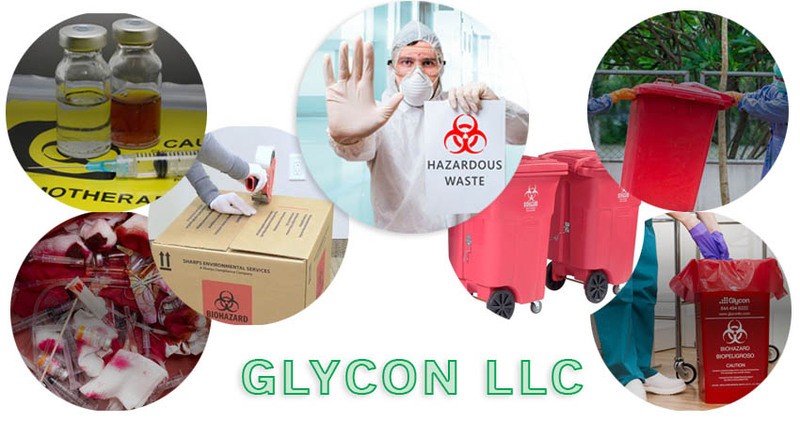 Glycon LLC has a diversified client base and aims to work with businesses so as to create a safe and healthy environment with the help of using proper disposal solutions. Pick-up options – Glycon LLC offers a variety of pick-up options no matter weekly or semi-annually. Glycon LLC will assist you in creating a schedule that meets your facility’s requirements. Availability – Glycon LLC is available from coast to coast. It provides services to the lower 48 states. Low prices, high customer satisfaction – Glycon LLC provides consistent and competitive pricing on all of its services. As our business is based on integrity, honesty, kindness, decency, respect, compassion and a belief in truth, justice, honor, love, and working together to make life better, we offer fair contracts with fixed prices. It doesn’t matter what kind of your business or industry, if you produce medical waste, Glycon LLC will help you certainly. Contact us any time you need by giving us a call at (844) 494-8222. Let Glycon LLC do the research to create a safe and compliant medical waste disposal plan that fits you and your business’s needs.